Cold Steel 62NGX 62NGX Extra Large G-10 Espada Plain Edge Folding Knife FREE SHIPPING! 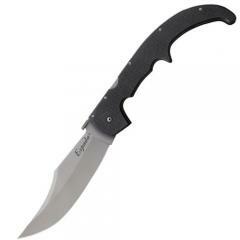 For a more budget-friendly version of the Cold Steel Espada knife, look no further. The Extra Large G-10 Espada Plain Edge Folding Knife boasts near identical features and functionality as its predecessor. The oversized clip-point blade is razor-sharp, ideal for efficient piercing and slicing action. It locks into place using shortened steel liners and Cold Steel's signature Tri-Ad® locking system, combining unbeatable security with rapid blade deployment when needed. The handle is crafted from rugged G-10, and ergonomically-shaped to allow for fine control of the large blade. Its non-slip, high-friction surface guarantees a secure grip in all weather and tactical conditions. An included stainless steel pocket/belt clip adds to the Espada's portability as an essential everyday carry item. ©2002-2019 CopsPlus.com: Cold Steel 62NGX 62NGX Extra Large G-10 Espada Plain Edge Folding Knife FREE SHIPPING!